Police are appealing for information after a man was seen kicking a young boy in the head and chest on a train. British Transport Police said the incident happened on a 16:00 service, travelling from Edinburgh Waverley to Peterborough last Sunday. 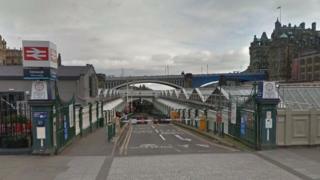 A spokesman said the assault, while the train was at Waverley Station, was on a boy aged two or three who was hit three times and kicked in the head and chest. The man, boy, and two other children, got off at Alnmouth in Northumberland. Police would like to speak to anyone who witnessed the alleged incident or anyone who can help identify those involved. The man was described as being white, of large build, with short, dark hair. He was wearing glasses, dark jeans and white Nike trainers. PC Joss Froggatt, said: "I would like to speak to anyone who was on board this service who may have seen or heard the incident. It is unclear at this stage exactly what took place, but we have had serious allegations made, so we are investigating to establish what happened. "If you have any information, please contact me by calling 0800 40 50 40 or text 61016, quoting reference number 324 12/2/17."